The Original Paddle Steamer Mt. Washington was launched at Alton Bay in 1872, and graced the waters of Lake Winnipesaukee for 67 years. In 1939, over the Christmas Holidays, the famous old sidewheel steamer Mt. Washington burned at the dock in Weirs Beach on Lake Winnipesaukee, New Hampshire. Fortunately the fire took place at night, and no one was injured. The dedicated captain of the ship, Leander Lavallee was very anxious to have a replacement built, and contacted General Ship & Engine Works early in 1940 about the effort. Lavallee had acquired the hull of the old steamer Chateaugay on Lake Champlain as a basis for the project. Carl and Byron Hedblom of General Ship & Engine Works took on the job of returning the Mount Washington to the waters of Lake Winnipesaukee. Byron Hedblom devised a unique plan to transport the Chateaugay hull in sections across land by railroad from Burlington, Vermont to Lakeport, New Hampshire. The hull was sliced into 20 sections like a loaf of bread, and each section was placed on a flat car for transport to New Hampshire's Lakes Region. The S.S. Mount Washington II was launched in August 1940. However because of fuel shortages the boat could not be placed in operation until after the end of WWII. 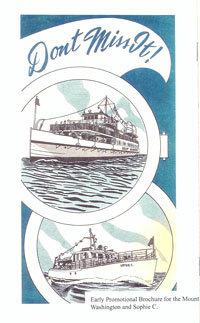 In 1942, the Mount Washington Steam Ship company Captain Lavallee had created was placed in Bankruptcy. General Ship & Engine Works made an offer to purchase both the ship and the company. 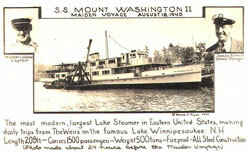 The Winnipesaukee Steamship Company was formed, with Byron and Carl Hedblom each holding an equal number of shares. 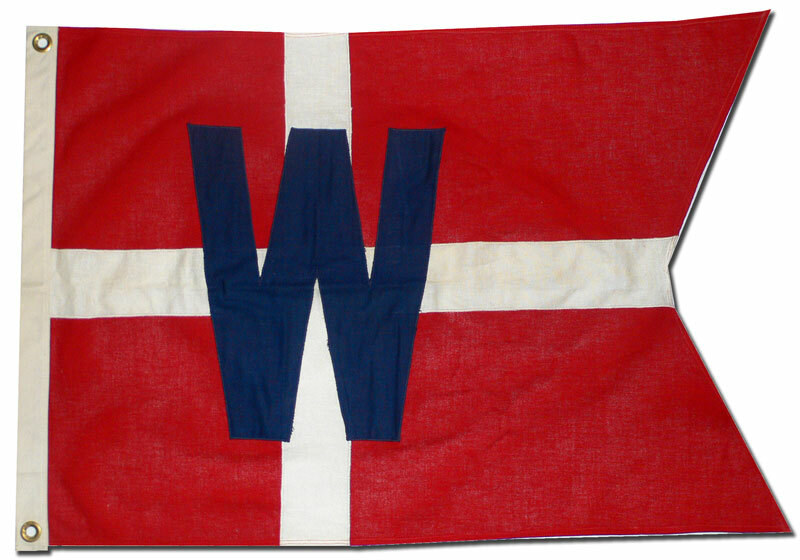 The company logo - and the ship's flag - would be a Danish flag superimposed with a W for Winnipesaukee. It was around the same time that Byron Hedblom saw an advertisement for 65-acres of land for sale near Weirs Beach, and bought the plot on which he would build the Hedblom family home. Due to fuel shortages during WWII, the ship could not be operated, and its engines were taken as part of the war effort. 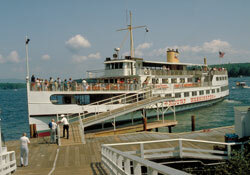 In 1946, new engines were purchased, and the Mount Washington II finally went into regular seasonal operation in 1947. 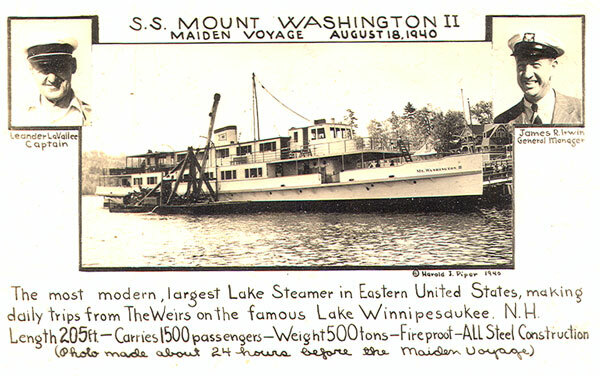 "Stretching to Serve You Better"
Two smaller vessels were added to the Winnipesaukee Steamship Fleet: The Sophie C. (named for Byron Hedblom's mother and christened by his oldest daughter Dory) and the Doris E. (named for his wife, and christened by his oldest granddaughter Wendy). 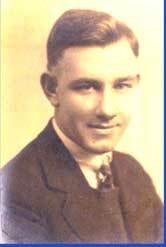 In 1959, Byron Hedblom sold his share of the General Ship & Engine Works to his two sisters and their husbands: June and Doug Brown and Ruth and Carl Roessler. Byron was now free to focus all his energies on the New Hamphsire excursion vessel business. In the late 1960s, after the death of Carl Hedblom, Byron and Doris Hedblom became partners and co-owners of the business. They continued to operate the Mount Washington, Sophie C. and Doris E. until 1972 when the company was sold to a local group. The proud tradition of the Mt. Washington continues to be successfully carried forward by the ship's current owners the Winnipesaukee Flagship Corporation. In an echo of the Mount's "sectional" beginnings, Byron Hedblom returned to New Hampshire in 1982 to oversee a major project to lengthen the hull. Called out of retirement at the age of 78 for the job, he was involved in every aspect of the operation. The hull was cut into two at dry dock, and a prefabricated hull section was inserted between the two "slices." The new and improved Mount was then welded together again, with her length increased from 205 to 230 feet. A famous tourist attraction, the Mount has been the subject of a mystery novel (Murder on the Mount) and even has a monopoly style board game named after it ("Follow the Mount" in which you can compete to buy up properties around Lake Winnipesaukee). 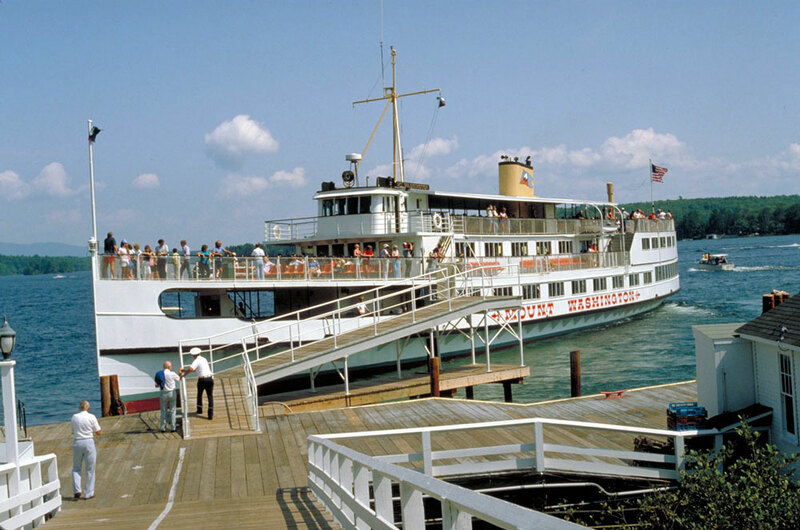 The Mount Washington continues to ply the waters of Lake Winnipesaukee today, delighting tourists and locals alike who greet the familiar ship with cries of "Here comes the Mount!"